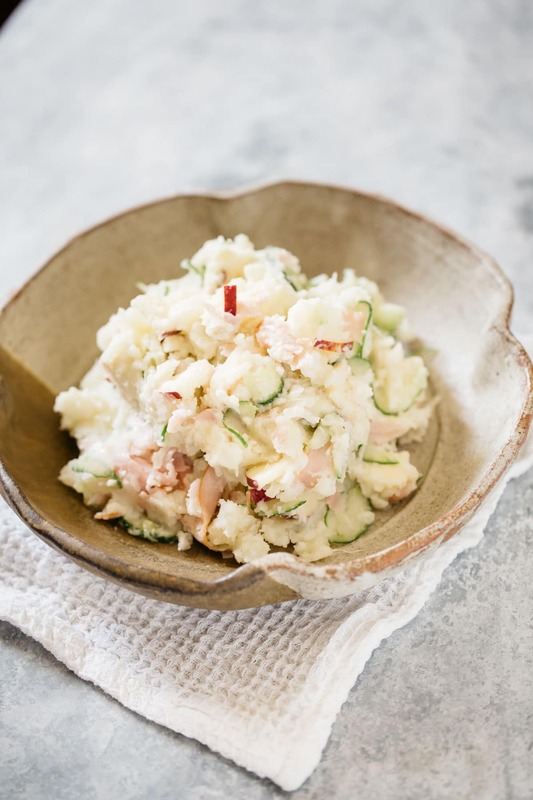 Japanese Potato Salad is a staple in Japanese-household’s home-cooking because it’s so easy to make, and uses ingredients everyone usually has at home! It has vegetables, carbs, and protein so it could make a nice little meal on its own, but it is usually used as a side dish. It also makes a great bento box filling! There are many potato salads out there, but why is this one called “Japanese” Potato Salad and what is so special about it? It is the texture and flavour that really makes this a must try recipe. 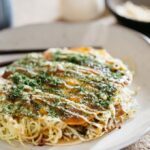 You can have variety of textures in one salad: a typical potato “hoku hoku” texture, a crunchiness from ingredients like apple and carrot, and a creaminess from Japanese kewpie mayonnaise. Many potato salad recipes say that waxy potatoes are most suitable for potato salad because they are high in water content therefore it will hold its shape when the cooked potato is tossed with other ingredients. That is the biggest difference I have noticed between regular potato salad and Japanese Potato Salad. Unlike many other potato salads, Japanese Potato Salads are half mashed so the potato should be a starchy or all-rounder variety. That way, when the potato is mixed with Japanese mayonnaise, the mashed part of the cooked potato creates a creamy texture but there is still some “hoku hoku” potato texture left as well. To achieve that “hoku hoku” texture, it is usually suggested that you boil the whole potato with skin intact… but this way the potatoes take a lot longer to cook. I usually peel and cut them into smaller sizes so they are cooked in a much shorter time. As I explained in Japanese potato croquettes recipe, the next step is to strain the water from the potatoes, put them back in the pot and give them a shake in order to help the moisture in the potato evaporate. 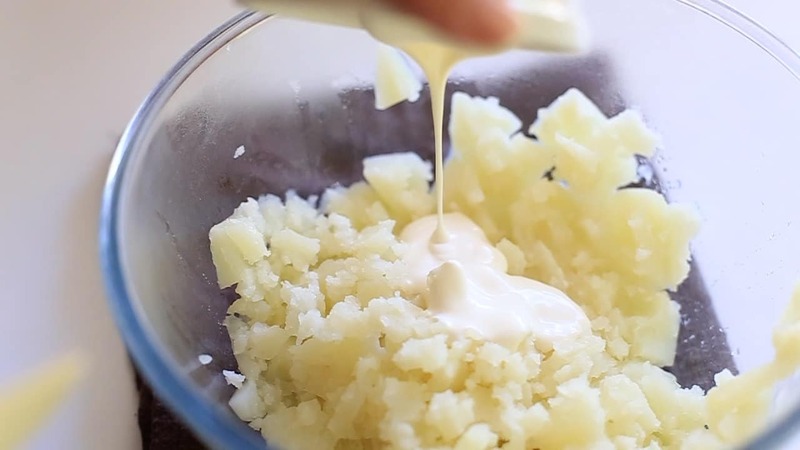 If you’ve seen my other recipes, you may have noticed that I use this mayonnaise a lot in so many different recipes. It can be used in almost anything I think… I even use it in pancakes because it makes them really fluffy and you can’t taste the mayonnaise at all. It’s only Japanese mayonnaise (Kewpie) that works in such a variety of recipes though. Regular mayonnaise has a different flavour and will dramatically change the taste of this recipe and others. Japanese mayonnaise are made from egg yolks (there are about 4 egg yolks in 450g mayonnaise), vegetable oil, vinegar and salt. It does not contain MSG. If it did, I would not buy and use it. And according to the Kewpie mayonnaise web site, rapeseed and soybean blended oil is used to create the vegetable oil. The company also brew their own vinegar from apple juice and malt. I think this is why Kewpie mayonnaise has such a unique flavour. 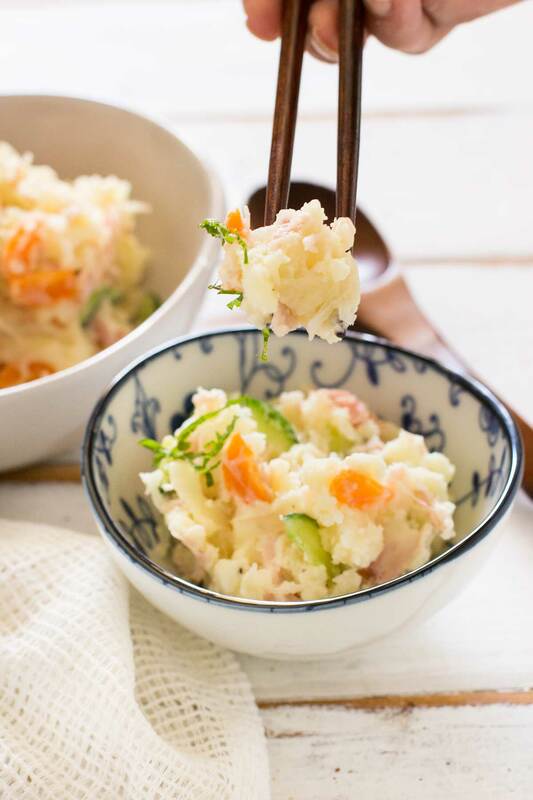 My original Japanese Potato Salad was originally published in 2016, and I added ham, sliced cucumber, carrot and onion to add a great pop of colour to the dish. This time though, I did not have any carrots on hand, but I did have an apple. So, I used apple instead. Apple adds both a nice crunchiness and sweetness to the recipe. Another good thing about Japanese Potato Salad is that you can add variety of ingredients. My suggestions for some possible ingredients you could include are apples, chopped egg, raisins, and some people even add green peas if you don’t have cucumber for a little hint of green colour! Japanese Potato Salad is a dish that tastes great either hot or cold! It tastes so yummy when it’s freshly made and still warm but it’s also yummy to eat the cold leftovers. So you can always make a big batch and eat some while it’s hot, then leave some in the fridge to eat cold later on – which is what we always do in my family. However you choose to eat it, I hope you enjoy it! 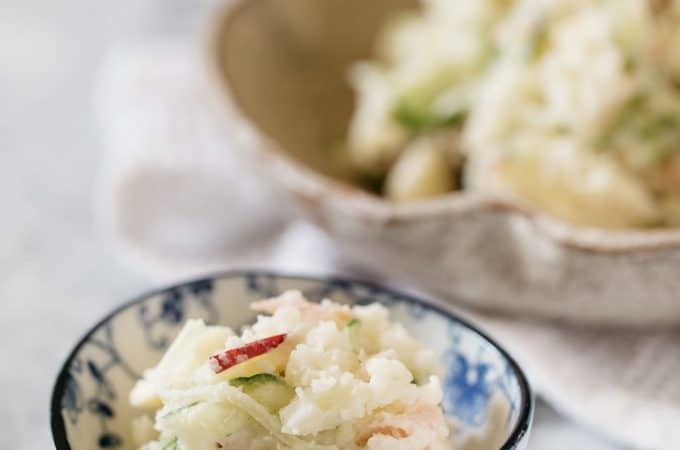 If you liked my recipe for Japanese potato salad, please rate it and leave a comment below. Also, don’t forget to follow me on Youtube, Pinterest, Facebook and Instagram to keep up to date with all the latest happenings on Chopstick Chronicles. Don’t forget to use the hashtag #ChopstickChronicles so I see your wonderful creations! Peel the potatoes and cut into small chunks. Boil for 10 minutes. Check if the potatoes are cooked by inserting a skewer. If it goes through, the potato is cooked. Strain the water from the potatoes, put them back in the pot and shake them around to rough up the outsides a little. Rip or slice the ham into small pieces and slice the cucumber and carrots/apples thinly. Add salt and pepper to taste then serve. *1. Cooking the onion in the microwave brings out the onion’s sweetness. *2. If you used apple, don’t cook it in microwave like carrot. Just chop them up into small pieces and add. *3. Mash while the potatoes while they are still hot because the pectin layer containing the potato starch is more elastic when it is hot. If you mash the potatoes after they’ve cooled down, the pectin layer loses its elasticity and starchiness which results in a mashed potato texture like “mochi” (a texture which is opposite to “hoku hoku”). *4. Add mayonnaise mixture while the mashed potatoes are cooled down to about 50-60 degree Celsius (120-140 Fahrenheit). Mayonnaise penetrates better at around that temperature and also stops the mayonnaise from separating. Other ingredients suggestions are boiled egg chopped up, green peas, sliced apple, raisins. This is a great side dish! you have a great selection of recipe. I love Japanese food – I will be back to check out more recipes!
? my bento box thanks you ? Ah… I love Kewpie! I put that stuff on everything 😛 But I never thought to use it in pancakes… very interesting. This is something I need to try! So I actually have everything on hand except the ham. But I do have bacon… Mmm, bacon 🙂 Can’t wait to make this! Great looking potato salad. I had noticed the use of mayonnaise in some of your recipes but I think that it suits them. This looks oishii! 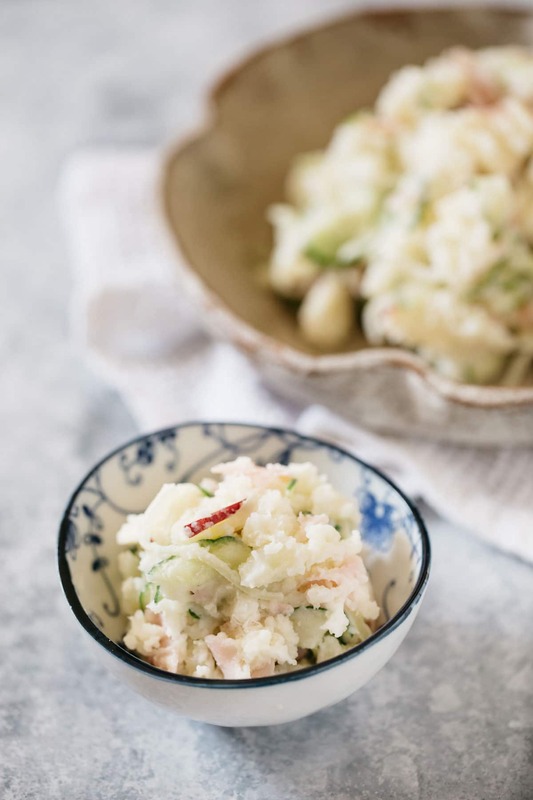 Japanese potato salad is so soft and fluffy, it must be the Kewpie mayonnaise. Arigatou Rebekah san 😀 Yes! must be mayonnaise! love your receipes , all of them, but why so many pictures? one is enough. Hi Betty, thank you. I personally just like to see a lot of different views of the food. But thank you for your suggestion. Love your photos! More photos add more depth. The dish was amazing! Hi there. 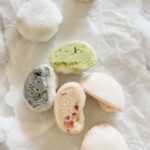 I just found your charming blog and I must say I am smitten with your Japanese food! Your photos are lovely and makes me want to dip into the food with my own chopsticks! I say, “More pictures, please!” Thank you for sharing your recipes with us, Shihoko! Hi F.Kane 😀 Thank you so much for your kind words. I fell in love with Japanese potato salad when I had some in a bento once, I’m so glad I could make it again!! Keep up the good work, you’re easily one of my favorite cooking blogs! Hi Shihoko. 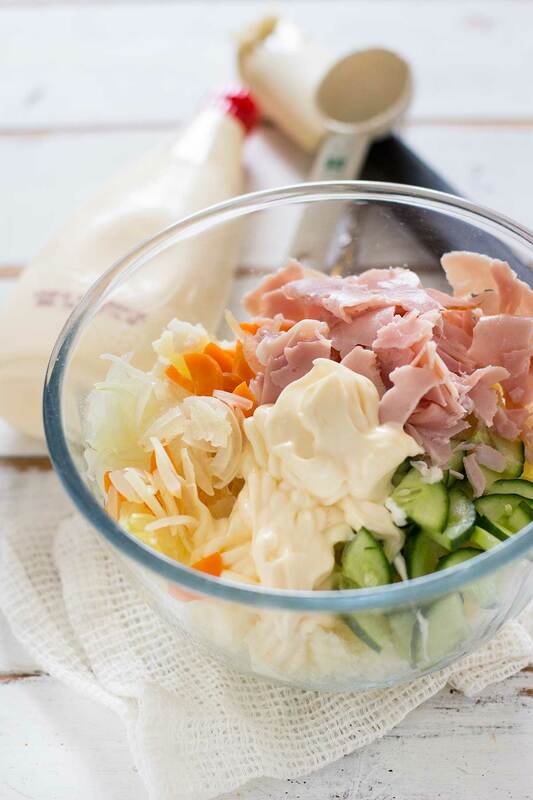 I love Kewpie mayonaise and love your ideas of having the colour and crunch in the salad. Why don’t you use your pressure cooker to cook the potatoes whole with skin on? That is how I do it all the time now and so easy to just pull the skins off then dice. So quick and easy. This salad is very delicious and healthy. I made yesterday. It was yummy! amazing i love it ! Just made this for dinner and it was so good! I lived in Japan for two years and it was so nice to have that taste again, it’s also much better than a lot of the potato salads they serve in restaurants or combini. I notice that several of your recipes call for microwaving things but as I don’t have a microwave, I just slightly fried the onion and carrot in a little butter. The salad was so colorful and tasty, I ate almost all of it by myself for dinner. Thank you so much! and we only like kewpie mayonnaise . 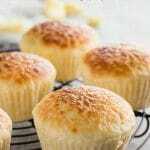 Thank you so much to share this recipe.